ROME, Italy — A HARMAN Studer Vista 9 digital console has been added to the technical inventory of the Auditorium Parco della Musica in Rome by Italian distributors Leading Technologies Srl. This will enable the different performance spaces within the complex to handle all elements of mixing for recording, music production, live events and broadcast television. Designed by renowned Italian architect Renzo Piano and inaugurated back in December 2002, the facility boasts three differently configured and differently purposed concert halls, set around a 3,000-seat open-air amphitheatre, alongside the Olympic Village. 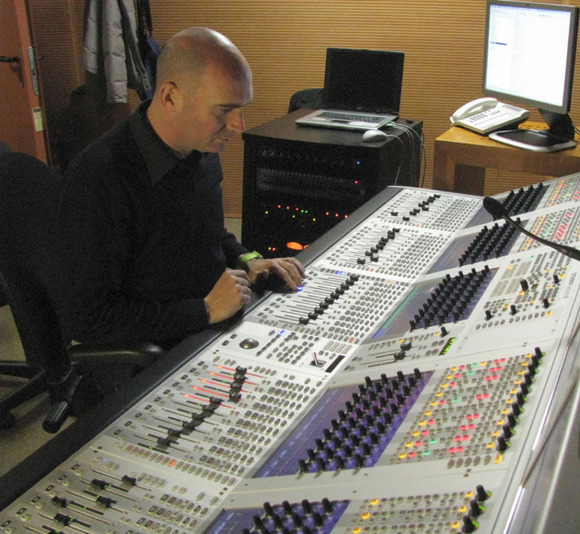 Optimised acoustically, and catering for all musical tastes, resident engineer and technical manager, Massimiliano Cervini, commissioned the versatile desk to cater for the diverse range of productions and requirements. The new initiative was strongly supported by the company’s CEO Dr. Carlo Fuortes of Fondazione Musica per Roma (Music Foundation for Rome), which manages the Auditorium, and the Production Manager, Roberto Catucci. Already with one of the highest levels of international technical standards of architectural acoustics, the arrival of the Vista 9 provides a further boost. Originally it was the concerts of the Royal Academy of Santa Cecilia that needed archiving, and such was their relationship with RAI Radio and Television that there was a requirement for two fully functional studios to record the concerts, taking feeds from the different halls. With the need to undertake a lot more post-production work, and handle live and broadcast mixing simultaneously (with universal audio/video routing), the facility decided to upgrade its console in the two control rooms. Two of the performance spaces, Santa Cecilia Hall and Sinopoli Hall, can now communicate via their own independent control rooms and the entire auditorium has broadcast-standard wiring, including the smallest Petrassi, Hall (which is now compatible with the two larger rooms). This has enabled Auditorium Parco della Musica to undertake live television operations, with direct connection through the tie-lines to external OB trucks, fully equipped with fibre optic broadcast and returns. In particular, this comes into its own during the Rome Film Festival. The new set up has already won the approval of EMI’s Abbey Road Studios in the UK, who used the facility recently and then decided to return. Among the features highlighted by Cervini are the console’s innovations and TFT metering, along with the ease of view and communication with older systems. Also there is its wide range of DSP cards and MADI slots (with ease of swap), offering ample redundancy (including channels dedicated to the D21m Stagebox I/O’s). “In fact, there are so many attributes, the list is endless: the dynamic automation and integration with Avid Pro Tools, the unique colourful FaderGlow [which provides the operator with an instant overview of the console status by illuminating each fader in one of eight freely-assignable colours], the innovative Vistonics touchscreen interface, dedicated to the beautiful TFT metering,” Cervini noted. “But overall, with the Vista 9 console where you touch you can see the display—you have everything under control with a visual reference right in front of your eyes, wherever you are!